Be Known for Something : Discover Your Church Communication Thread / Communication Strategy / Attention!!! The wrong 1st impressions are dangerous! I was recently visiting a church to teach a Ministry Leadership Workshop. It was my 1st time there, and I walked through the doors of the main entrance, not really sure where I was supposed to find the main worship area. I glanced around for a sign. Any sign. And the largest, brightest yellow sign caught my eye. Instead of a nice welcome, or a directional sign to show me the way, I got a stern warning. Nice. It’s very similar when some churches have large, stark, ugly signs that tell me to shut my phone off before entering the worship center. I’ve even seen large projection slides that warn impending doom if my phone goes off during the service. I guess, the embarrassment of the moment isn’t enough. 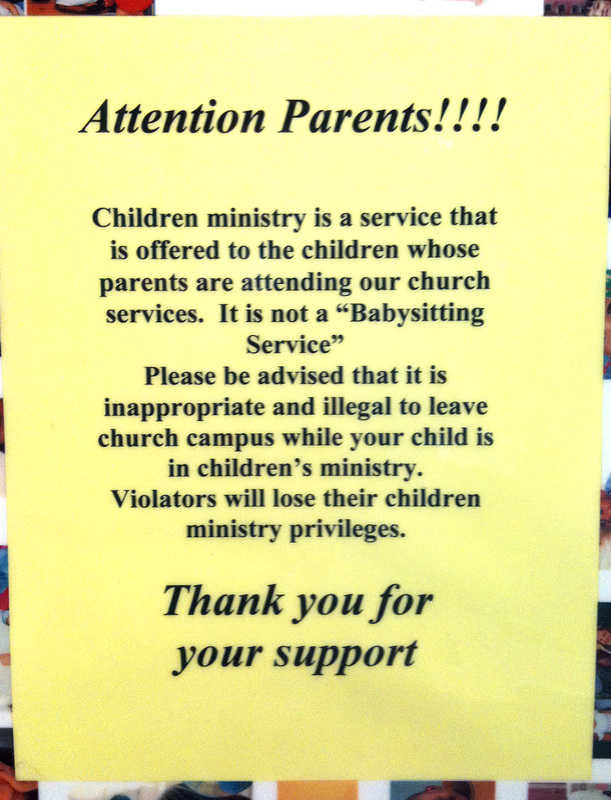 This all begs the question: Should we have unwelcoming, warning and impending-doom signs in the church? I’m not talking about the “government-imposed” exit or no smoking signs. I’ve seen signs telling people to put my trash in the garbage cans. And the famous “Please have an attitude of worship in the Auditorium” or “No food or drink!” signs. First impressions are so critical when someone is visiting your place of worship. It would be best for you to enter through your main doors and see what the impressions are when it comes to signage. Do you treat your people like they’re school children? “Demand” signs are counter-intuitive to the “everyone’s welcome” attitude we should have in a church. These signs play into the perception that churches want people to attend, only if they’re willing to obey certain rules. Excessive warning signs just look petty. Like the Librarians or Trustees have taken over the House of Worship. Adding a thank you at the end of a stern message doesn’t soften it. Be sure that the signs people remember represent your church. Professionally designed signs are much better than any in-house sign that looks like it was Publisher produced. Look in the local theater or auditorium to see how “secular” buildings do it. The church should be nicer, politer and held to an even higher standard. Great post, Mark. It made me laugh as it made its (very valid) point. Really enjoyed our discussion the other day and can’t wait until the article comes out. Wish I was going to be at WFX to meet you! You hit the nail right on the head with this one. Great post. So many churches miss some of the most obvious things…like that sign. Great way to turn someone off. Thanks Bobby! I like your take on things too. I love that you’re serving the church!